This book discusses issues in large-scale systems in the United States and around the world. The authors examine the challenges of education, energy, healthcare, national security, and urban resilience. The book covers challenges in education including America's use of educational funds, standardized testing, and the use of classroom technology. On the topic of energy, this book examines debates on climate, the current and future developments of the nuclear power industry, the benefits and cost decline of natural gases, and the promise of renewable energy. The authors also discuss national security, focusing on the issues of nuclear weapons, terrorism and cyber security. Urban resilience is addressed in the context of natural threats such as hurricanes and floods. 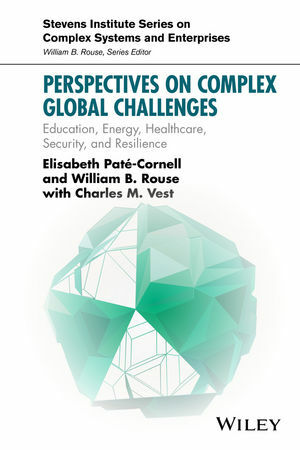 Perspectives on Complex Global Challenges: Education, Energy Healthcare, Security, and Resilience serves as a reference for government officials, personnel in security, business executives and system engineers. Elisabeth Paté-Cornell, PhD, is the Burt and Deedee McMurtry Professor of Engineering at Stanford University in the department of Management Science and Engineering, which she chaired from its creation in 2000 to 2011. She is a past president of the Society for Risk Analysis. She served as a member of the President’s (Foreign) Intelligence Advisory Board from 2001 to 2008. She is a member of the National Academy of Engineering and of several boards including InQtel, Draper Laboratory and Aerospace Corporation. William B. Rouse, PhD, is the Alexander Crombie Humphreys Chair of Economics in Engineering at Stevens Institute of Technology, and Director of the university-wide Center for Complex Systems and Enterprises. He is also Professor Emeritus of Industrial and Systems Engineering at the Georgia Institute of Technology. Dr. Rouse is a member of the National Academy of Engineering. Charles M. Vest, PhD, was president emeritus of the Massachusetts Institute of Technology (MIT) and president emeritus of the National Academy of Engineering. A mechanical engineer, he previously was dean of engineering and provost at the University of Michigan, and was a trustee of several universities and non-profit organizations devoted to education, research, and national security.